Thursday morning, Axios' Mike Allen sat down with leaders on both sides of the aisle to discuss America's national security and the impact it will have on the midterm elections. Why it matters: The midterms are approaching and election security remains a question. Sec. Ashcroft, who has claimed voter fraud is an exponentially greater threat than hacking, discussed the flaws he sees in our elections. "The biggest vulnerability to our election system is the public's perception of it." "The only way our elections are in trouble is if you don't vote." 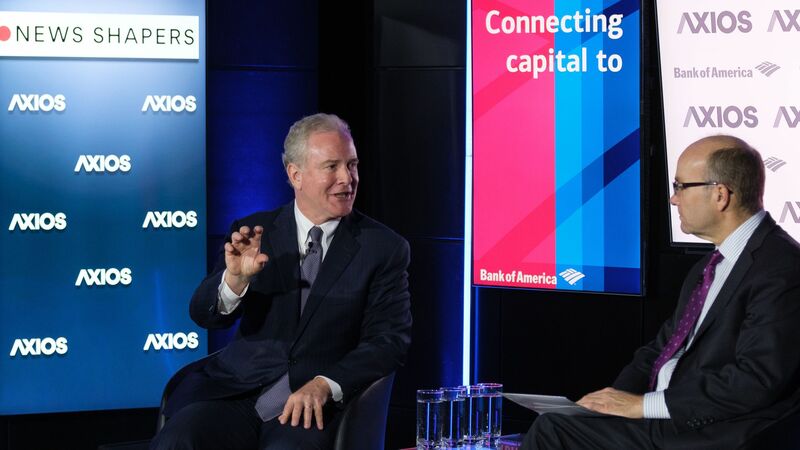 Senator Van Hollen, the author of the DETER Act, explained how the bill would prevent election interference. "What the deter act does is very simple, it would say that the Director of National Intelligence — two weeks after every election — will do a review and determine whether there's been foreign interference. If the DNI determines there's been interference, you would have automatic, swift, and very tough penalties." "I think we're safer, but we are not safe ... We're more aware of the cybersecurity threat and information operations, but we also have tremendous gaps." Thank you Bank of America for sponsoring this event.